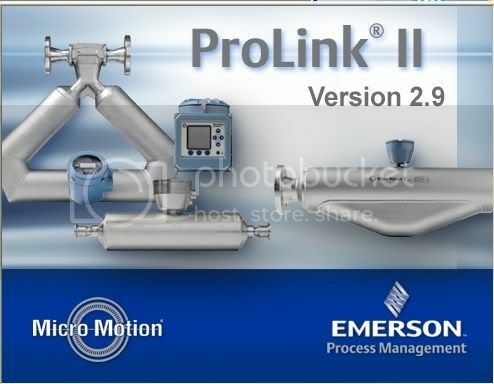 any one have ProLink II for MicroMotion massflowmeter? Last edited by sania on Sun Apr 12, 2009 7:09 am, edited 1 time in total. I have a version 1.2, you meet? if you want, you send me your e-mail that I sent to you! Do you have the new version 2.2 or newer for upgrade it? I am looking also for a new version of prolink. If someone have, please share. I'm still searching for prolink II. Anybody? Last edited by vlad2006gr on Tue Sep 17, 2013 9:08 pm, edited 1 time in total. but how to crack it to use forever? Please, Could you upload this Prolink again? Hi. Please, Upload the Prolink II again!! I really need the software. Thanks! i get the msg "THIS SOFTWARE CAN ONLY BE USED FOR UPGRADE A PREVIOUS VERSION OF THE PROGRAM" so i can't install it.. i need to modify the setup.exe to let me install it? PLEASE I NEED the software ! thank you so much for sharing and your effort! Someone could run PROLiNK II with crack ? You do research for activation yourself.